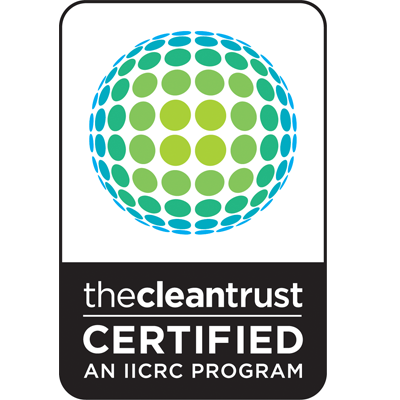 We Are The Commercial Carpet Cleaner You Can Trust. 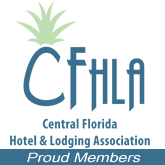 Our commercial carpet cleaning services are offered in Orlando and Coast to Coast in Central Florida and extending north and south on each coast roughly 200 miles. We offer services in even further extended areas to chains and franchises, also. These cleaning methods are both very effective and our technicians will help you determine which is best for your flooring and also which is most appropriate for the type of traffic your establishment experiences. For most hotels, high-occupancy, and high-turnover establishments, our VLM Restorative Cleaning process offers a faster cleaning process with less dry time needed. This process uses a CIMEX delivery with encapsulation of oils, dirt, spots, and bacteria. Though the moisture content is much lower, this carpet cleaning process provides excellent results. We still use commercial grade air movers to finish the carpets and are able to clean and dry in less time than traditional hot water extraction services. In our Traditional HWE Cleaning process, we use the latest technology in steam cleaning with the most powerful equipment in the steam cleaning industry. Our truck mount systems are custom built to run off the engines of our commercial trucks to provide quiet, strong, and consistently heated steam and extraction for the ultimate cleaning experience. When using steam, this extra power and precise heat is necessary to get even results and to extract the most moisture, reducing dry times and extending the valuable life of the carpet fibers and flooring elements. Letting water (even clean water) sit longer than necessary on carpet fibers can create moldy musty smells and greatly reduce the life of commercial flooring. 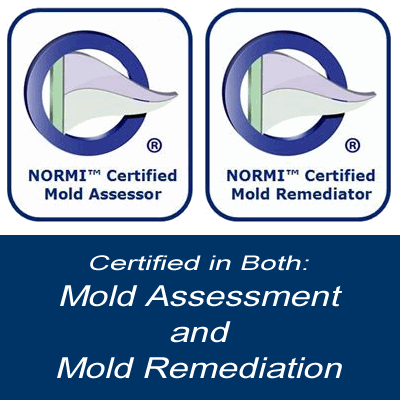 Some commercial properties set up a cleaning pattern of one HWE Cleaning after every two or three VLM Cleanings. Some flooring or traffic situations require one or the other specifically. 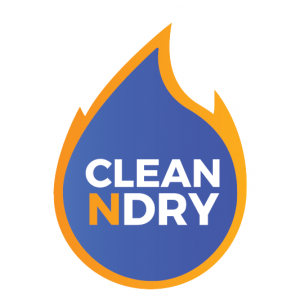 Your Clean N Dry technician is trained to analyze the details and offer the best options and plans for each situation. We always recommend the Clean N Dry signature ‘Safe and Durable’ carpet stain protection application once carpets are clean and fresh. Our protection lasts for between 2 and 3 HWE or VLM cleaning services and ensures you get to keep your ‘Clean N Dry’ floors longer. Our ‘Safe and Durable’ protection offers extended time to clean up spills and spots, along with beading of most liquids to have the best chance of keeping spots and spills from becoming stains. The added durability in between cleanings can greatly extend the life of your flooring investment. The signature cleaning agents we use are superior in their proper PH balance so they won’t ‘brown’ berber or deteriorate the glue down backing used in CGGD (Commercial Grade Glue Down) flooring. We strive to ensure the products we use are appropriate for the type of carpet fibers and construction applications to maintain the warranty and extend the life of your flooring investment. 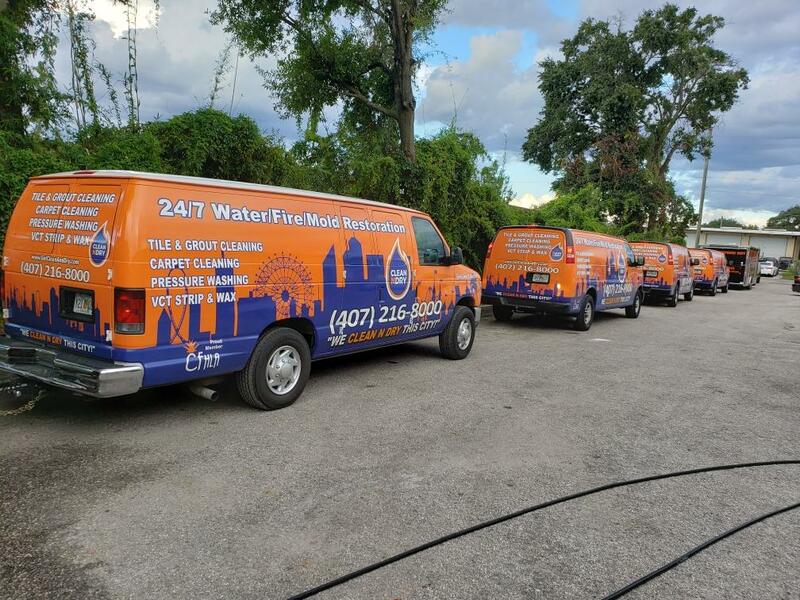 Our technicians and staff are experienced in commercial service delivery, friendly, competent, and driven to meet and exceed your expectations. Let our highly trained and certified team members provide the cleaning services you can look forward to and count on. 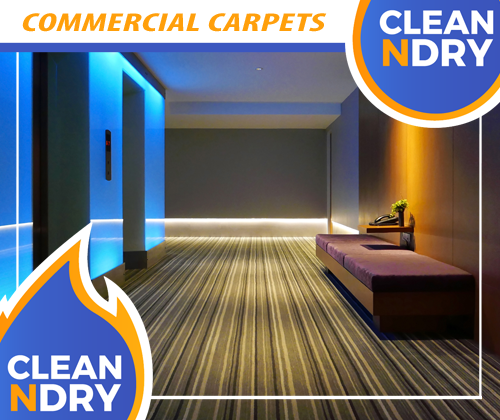 We look forward to making and keeping your commercial carpets and flooring Clean N Dry. HOW SHOULD YOU CHOOSE A COMMERCIAL CARPET CLEANING COMPANY?